I hope that my sincere apologies (and just-as-sincere admiration) for Sidney Harris will keep me from being sued for copyright infringement. Then again, I'm not sure you can copyright a phrase. Oh well. Poster, please? I need this for my office! What are your thoughts on the nature of a "book"? 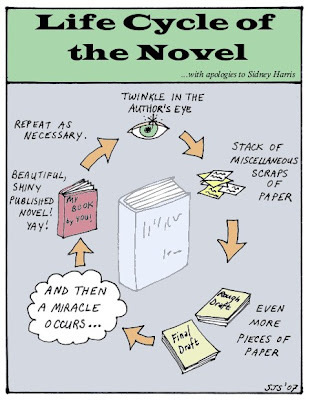 I'm not a fiction writer, but I have a feeling that "miracle" occurring is a long, crazy-making process for you writers! Great 'toon. Thanks! You know, I read this thing about the nature of the book -- I believe that from the writer's perspective, the copyrighted text is their book, regardless of format. The real question here seems to be what or who determines the meaning of a word: authors or publishing /marketing? Many authors I know have tried to protect by copyright their eBooks... it's not yet possible, as publishers and agents tend to work in a bloc; no one else is doing it, so individual authors concerned about their electronic rights in the future just have to wait.